In the fifties and sixties, legendary filmmaker William Castle was known for delighting audiences with his one-of-a-kind fright films and outrageous gimmicks. 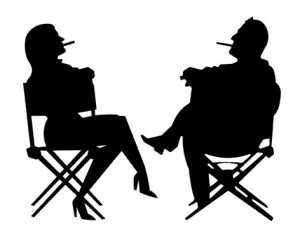 Fast forward to 2011 and to his daughter, Terry Castle, who can’t wait to give audiences something new to scream about! “It’s an honor to resurrect my father’s brand. I work tirelessly to be true to his vision… frankly, if I didn’t, there’s no telling what might happen…” Terry says, tongue firmly planted in cheek (just like her Dad!). “Dad loved watching the kids in his audience sitting in the dark with eyes wide open, hearts racing and screaming with pleasure… it was pure bedlam. Even as adults, they remain dedicated fans who continue to be thrilled by his work.” Terry wants to offer modern-day audiences those same thrills… a unique, purely fun experience with a wink and a nod to days gone by. So we’re pleased to announce the re-launch of William Castle Productions beginning this October with the first in a series of Young Adult/Fiction novels plus a series of publications never before seen by the public, one-of-a-kind artifacts of motion picture history. William Castle returns… to the bookstores! 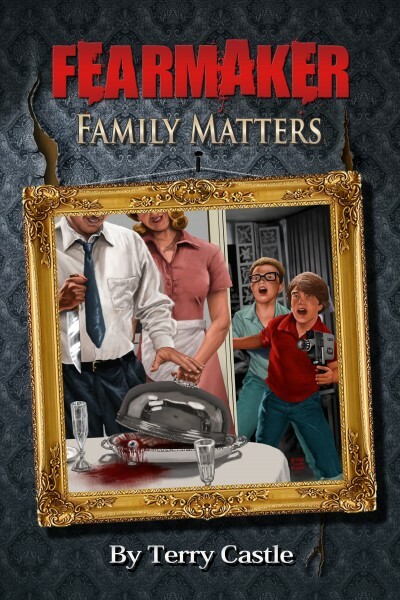 William Castle’s most loyal fan base was kids, and keeping that in mind, Terry is poised to release her debut novel for Tweens, FearMaker: Family Matters on October 16, 2011, just in time for the Halloween season. 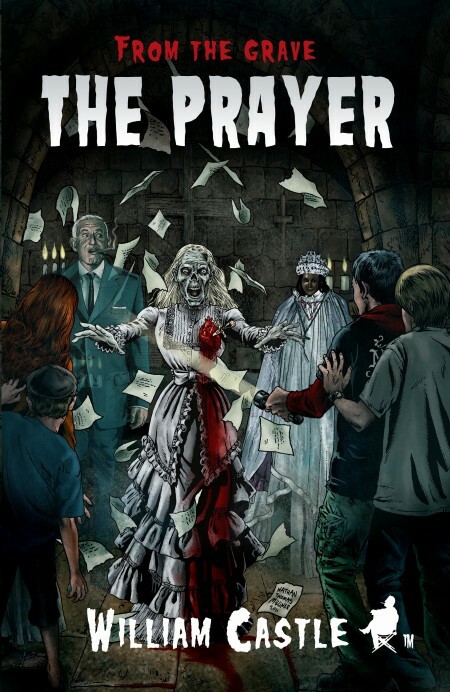 With From the Grave: The Prayer and FearMaker: Family Matters both competing for the Young Adult/Tween attention, Terry is confident we will see some good old-fashioned ballyhoo to celebrate their release. House on Haunted Hill remains a classic chiller to this day. Produced and directed by William Castle and written by Robb White, this classic shocker is beloved not only for Castle’s suspense-filled direction but what came to be known as “The Gimmick,” carnival sideshow trickery that both scared and delighted the audience. The film stars the inimitable Vincent Price and features the classic gimmick, Emerg-O… a skeleton that flew out of the screen and over the heads of the uproarious crowds. House on Haunted Hill: A William Castle Annotated Screamplay features the script’s original formatting, maintaining the integrity of the authentic screenplay replete with Castle’s own hand-written notes. In addition, the book cover imitates the leather-bound binder that Castle used for every movie. William Castle Productions, in keeping with the Spirit of The Gimmick, presents this book with Emerg-O, simply flip through the pages and scare yourself silly! 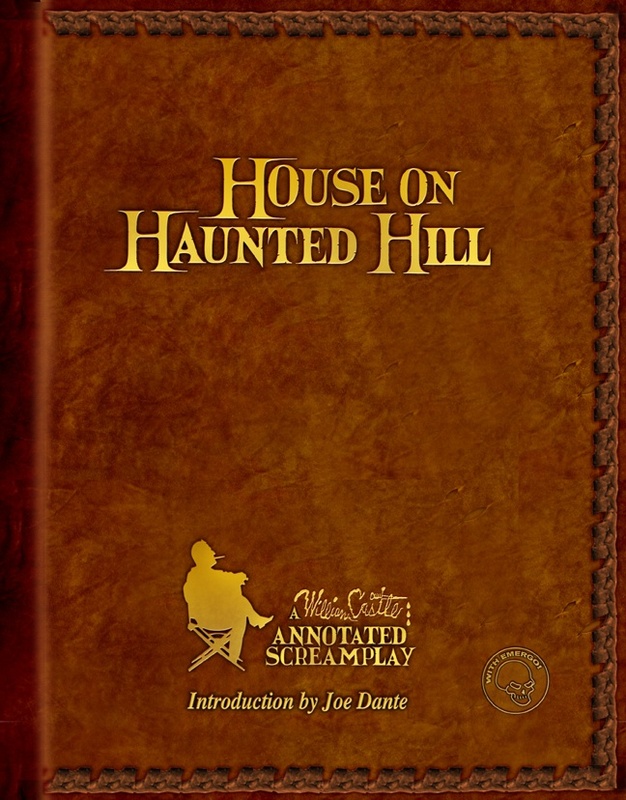 House on Haunted Hill: A William Castle Annotated Screamplay, includes a foreword by acclaimed director Joe Dante (Gremlins, The Howling, Matinee), hailing the book as “an important artifact… you can actually imagine what it was like to be there on the set.” It also includes an introduction by Terry Castle, who shares her personal thoughts on this seminal piece of film history. Also included is a critical perspective of the film by writer and illustrator Charlie Largent… and a special welcome from William Castle himself! 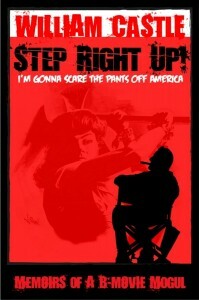 The latest novels from William Castle Productions are just the beginning. Terry Castle is in development with Spine-Tingler: The Musical, an interactive and immersive theatrical experience that centers on horror films and her father, William Castle. Terry is preparing The Mind Thing, a sci-fi/horror novel, for the big screen. Written by Fredric Brown, one of science fiction’s great authors, William Castle Productions optioned his novel in the 1960s but never reached the production stage. Terry has partnered with Academy Award-winning Visual Effects Producer Craig Barron (www.matteworld.com) to bring this uniquely startling story to life. Also in the works is an original screenplay written by Dan Dillard and Terry Castle, The Toothless Dead. Designed for young audiences, The Toothless Dead is a horror story revolving around the legend of “The Tooth Eater.” Most have heard of the tooth fairy, but The Toothless Dead is a terrifying twist on that gentle legend. In development for television is Animus written by Alan Berger and Kathy Gori. Animus was the last story being developed by William Castle before his death in 1977. Animus is a one-hour sci-fi/thriller with echoes of The X Files and The Walking Dead. Twelve-year-old Adam Castle lives in a mansion in Beverly Hills. But for him, life is just like any other ordinary twelve-year-old. That is, until he mistakenly overhears the unsavory truth about his father. Dear old Dad is a homicidal maniac and lovely Mom is his beautiful accomplice. To make matters worse, Adam overhears a sweet little conversation where he learns that his dad’s next victim will be one of his favorite classmates, Jennifer Isles. Jen is the first girl Adam has ever really liked, I mean got-caught-staring-at-her-more-than-once liked. And his father has plans to kidnap her and bury her alive until a ransom is paid. It seems that Jen’s pretty little head will be whacked off by his loving father, if Mr. and Mrs. Isles don’t go along with his Dad’s maniacal plan. Adam’s ordinary life just took on a demented twist as he steps into the wonderful world of the macabre. As the Gypsies gather in the ancient village of Les-Saintes-Maries-de-la-Mer for the annual celebration honoring their patron saint, a mystical convergence of events brings four adolescents together at a haunted house and sets them on a perilous quest to locate a centuries-old manuscript that holds the power to release the devastating force of the Ancient Ones upon the Earth. Fifteen-year-old Sarah and her younger brother Luca are lonely Gypsy kids who travel about Europe with their parents. Forced by their Gypsy father to beg and pick pockets for money, Sarah and Luca find it impossible to earn their father’s approval. Fifteen-year-old Edgar cannot stand his parents (and the feeling is mutual) when the family moves from New Jersey to France so that his parents can live out their dream of being French aristocracy. Fourteen-year-old Aleck’s world is turned upside down when his parents are killed in a car crash and his older sister decides that he would be better off in France with their Aunt and Uncle whose real concern is their own lavish lifestyle. 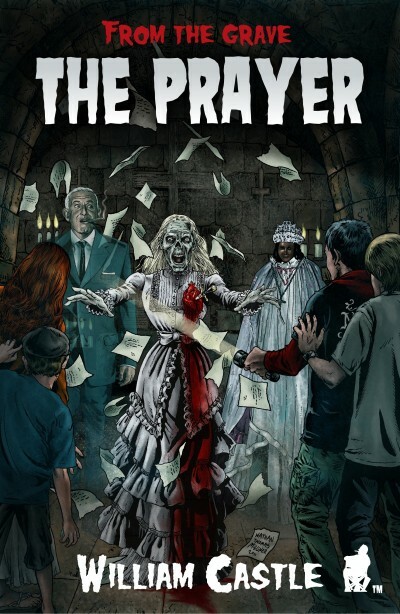 Beset by their parents and guardians, the four young people must also survive the mercurial activities of a spirit haunting the house that holds clues to the location of the manuscript that is also sought by a secret society bent on locating it for its own purposes. In a frenzied chase that takes them from the ancient villages of Provence through the blood-soaked quarries of Roussillon to the macabre catacombs of Paris, the four must put aside their differences and suspicions to outwit the evil forces who will stop at nothing to get their hands on the ancient book.